"Isn't this the carpenter? Isn't this Mary's son and the brother of James, Joseph, Judas and Simon? Aren't his sisters here with us?" And they took offense at him (Mark 6:3). In 2005, a movie entitled The Passion was released that chronicled the last twenty-four hours of Jesus' life. 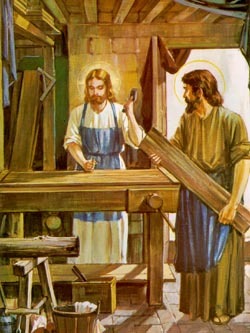 During a flashback scene, Jesus was seen in his carpentry shop making a table with his mother standing by playfully observing. It was a very beautiful scene that reminds us that Jesus was a carpenter for most of his adult life. In fact, Jesus was more qualified to be a carpenter than the Son of God in the eyes of the people because that is the history they knew of this young working class man from Nazareth. Consider that in the New Testament of Jesus' 132 public appearances, 122 were in the marketplace. Of 52 parables Jesus told, 45 had a workplace context. Of 40 miracles in the book of Acts, 39 were in the marketplace. Jesus spent his adult life as a carpenter until age 30 before he went into a preaching ministry in the workplace. And, 54% of Jesus' reported teaching ministry arose out of issues posed by others in the scope of daily life experience. Saint Bonaventure said, "His doing nothing 'wonderful' (his first 30-years) was in itself a kind of wonder." Work, in its different forms, is mentioned more than 800 times in the Bible -more than all the words used to express worship, music, praise, and singing combined. God created work and He is a worker. "My father is always at his work to this very day, and I too, am working" (John 5:17). So, the next time you are tempted to minimize your daily work as anything less than a holy calling, remember that Jesus was a workplace minister as a carpenter in his community. He has called you and I to reflect His glory in our work. I love this post, I will have to check out the link. I use to feel like my work was just taking time away from God, but when I could just relax and feel comfortable with my light shining work became my own little ministry. Biblical encouragement is the best. It feels great to know I do what Jesus did.